Remember when I posted how my Garmin registered longer mileage than usual on my run home? I finally put it into Garmin Connect to try to understand why. And this is TOTALLY weird! So this is my usual run home… Pretty straight forward, right? 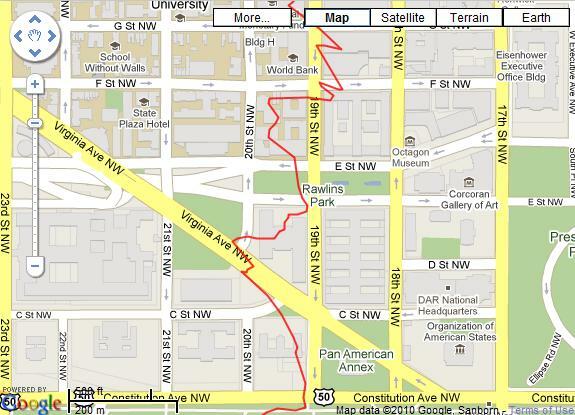 I run down 19th st, and though I’m not really running around on the street, but on sidewalks instead, I forgive the Garmin for not knowing that. I always go down the same route for 2 reasons: I like having something concrete to compare my runs against, and I found out the hard way that not all streets leading up to Constitution Av have a crossing light. Now this is what it THINKS I ran last Monday. WTF? Those gray boxes I’m running zigzag on? Those are buildings, people, not parks. This is downtown DC, after all. My Garmin thinks I can cross walls. No wonder it registered an extra 0.12 miles! The only explanation? My Garmin thinks I’m a drunk. Has anyone ever had this happen to them before? What kind of wonky satellite signal was it picking up?? Hahaha! No solutions, but that second map made me laugh 🙂 Good luck, I hope you can get it resolved! I just hope it doesn’t happen again! 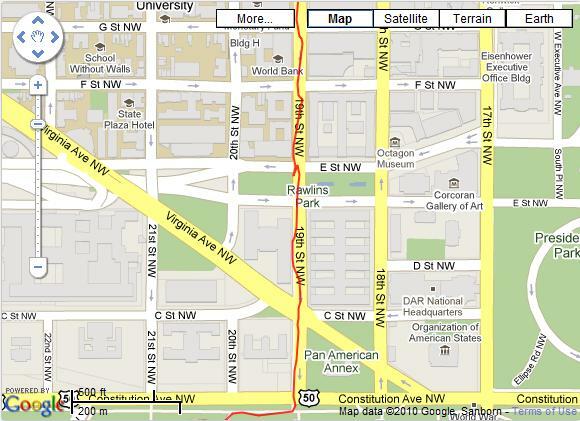 Seriously, I’m running in a straight line, even if signal was spotty, it would assume I went straight, not in zigzag, right? My Garmin has me zigzagging too sometimes, but never quite that bad. Maybe it has a hard time maintaining a satellite connection with all the tall buildings? I hadn’t had issues before… DC buildings are actually fairly short (maximum of 12 or 13 floors) since nothing can be taller than the Capitol. I just hate that it assumed I went crazy zigzagging across building walls! Whoa… definitely never had that one happen! How weird. Let us know what you find out! Does that mean that when it finally started recording on a straight line it assumed I caught the bunny? HA! Your Garmin thinks you’re a drunk! LOL. Glad to know my funny self finally came across in my writing — I usually sound totally boring when I write, I hate it! The post was a combo of frustration (WTF, Garmin!) and a joke, because seriously, what the hell did it think I was doing to give me the zigzag runs like that? I have only had that happen when I was walking in Chicago. I think it happened because I was turning it off and on a lot and because the tall buildings make it harder to get a signal. Are you sure that isn’t really the route you took? LOL!